If there is one name synonymous with Christian family values, parental advice and influence, that name would be Dr. James Dobson. With titles which are mentioned in churches, mom’s groups and Christian circles everywhere, one anticipates a title such as Bringing up Girls to be loaded with the plethora of helpful information and wisdom that has made Mr. Dobson famous. 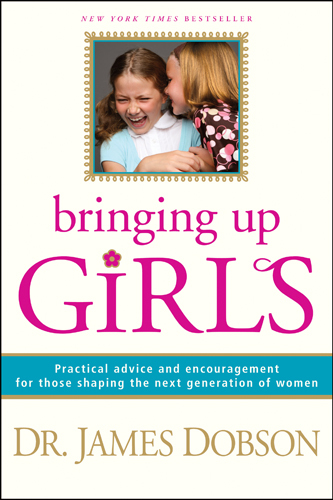 The front cover of the book states “Practical advice and encouragement for those shaping the next generation of women”. This would have to be the long awaited companion to Bringing Up Boys, from the man who has fathered his own daughter and son, hosted his own talk show and brings his background in clinical psychology and practical faith to all he shares. On one hand I really did not love this book overall. I think that a lot of it was information overload, and it felt like I was back in one of my Early Childhood Education classes for a bit. We know these are perilous times for girls and children in general. But as a parent, a mom to be specific, I am looking for practical encouragement and advice without an overload of research to back it up. It’s not that I do not want any, it can be discouraging as opposed to encouraging. I think it’s hard to avoid the reality that the days are frighteningly evil and getting worse. On the other hand, Dr. Dobson delivered a thorough perspective and viewpoint of raising girls in this conflicted culture. I would suggest reading through the chapters that really speak to you, as opposed to reading right through. It is a book I would refer to again and again so I certainly am glad it’s in my current library and would say that if you have profited from Dr. Dobsons prior books you will appreciate this resource for your Christian library! There were a couple of parts of the book that I thoroughly enjoyed. Chapter 10 is one of my favorites. It is a list compiled by another author and titled “Fathers To Daughters”. Parents are whisked from childhood right through the teen years in this list of suggestions, wisdom and tips for cherishing each moment and gaining a clear perspective in light of the bigger picture. This was encouraging and challenging. Tender and painful! I also loved a part where the good Doctor gives his perspective of the monthly cycle and I will just say it is the most perfectly profound perspective I have ever read. That alone is worth the read in Chapter 18 which covers Puberty and Adolescence. Last but not least the question and answers are really one thing that he does well. He was not as detailed at times but reiterated from other instances he has addressed some of the topics in his previous books. wisdom and insight you will not be disappointed. I warn you though, it’s not all sugar and lollipops. I received this book for the purpose of review.